Searching for Married Life quotes. If your answer is yes, now you don't need to. 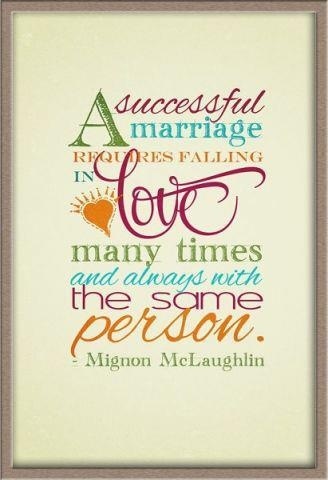 Here I have compiled down some of the popular quotes on married life and marriage for you. Just hope you find this quote compilation helpful and share some of the quotes with your friends. Married life can seem as if it's only five days long. The first day you meet, the second day you marry, the third day your raise your children, the fourth day you meet your grandchildren, and the fifth day you die first or bury your spouse to go home alone for the first time in many years. Is this better or worse than being married and living in the suburbs? Better or worse? Who can tell? Marriage can bore you but there is a fortitude that comes from it, too. When you need to lean on it, you are so thankful that you can. It's weird, marriage. It's like this license that gives a person the legal right to control their spouse / their 'other half. Getting married is like permanently grafting your hand to the cookie jar. No matter how sweet those cookies may taste, you can't help but wonder what would have happened if you'd chosen some other dessert--brownies, for instance ... or frozen yogurt ... or maybe chocolate strudel.